Meat lovers, you're in for a treat. Don't miss out on these sumptuous offerings, served for a limited period only. Plus, there are also a few collaboration dinners worth checking out, as well as an Earth Hour and Earth Day menu for a healthy feast. Indulge in the bounty of spring with Fat Cow’s Haru Matsuri menu, available from now until May 12. It’s a delicious 12-course omakase set, best enjoyed with a specially-curated flight of alcoholic drinks you can have with a top-up. The wagyu beef of choice is from the Nagasaki prefecture, considered one of the best in the world, especially after winning the Prime Minister’s award in Japan’s National Beef Quality Competition in 2012. Highlights include the rib carpaccio artfully presented on a plate with creamy sea urchin, caviar and black truffle, paired with Roku gin; a gently roasted sumiyaki beef tongue with a spritz of sudachi lime enhanced with Chita whisky, brimming with notes of honey and wood spice; and the sumiyaki striploin that’s marinated with the chef’s special yakiniku sauce and then charcoal-seared, served with the popular Tengumai Yamahai Junmai. These are interspersed with non-meat dishes, including marinated Japanese cucumber, which is a good palate cleanser, and the ice fish tempura, another Japanese spring delicacy. Executive Sous Chef Zacharie Ong will be serving The Art of Yukimuro from April 5 to 30. It’s a curated menu that puts the spotlight on the coveted snow-aged beef, prized for its rich marbling and melt-in-the-mouth texture. The appetisers alone already sound decadent, with standouts which include the juicy truffle beef tartare topped with sunny side up quail egg and a side of nashi pear salad; and smoked snow beef carpaccio with shaved asparagus salad, black garlic, and cured egg yolk. For meat lovers, there’s no doubt that the star dishes are the Yukimuro snow-aged wagyu beef A4 snow beef striploin and A4 snow beef ribeye, both of which are bursting with succulent flavour. Chef Aitor Jeronimo Orive and Oldřich Sahajdák, head chef of one-Michelin-starred Degustation Bohême Bourgeoise in Prague, are bringing Czech and Basque cuisines together in a not-to-be-missed collaboration event from March 28 to 31. The six-course lunch and dinner menus are a collection of their most creative work. 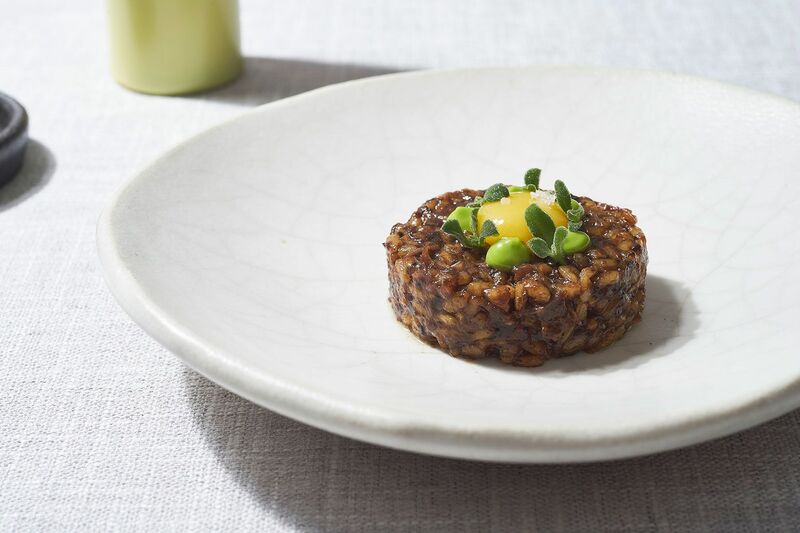 Aitor will be serving ankimo (monkfish liver), typically used in Japanese cuisine but his version is outfitted with escabetxe, carrot gel and Yarra Valley salmon roe, and his signature oxtail bomba rice packed with angus oxtail and onions. Sahajdák matches these with stellar creations like a Czech pork dish comprising hot pork sausage with apple and cold mustard, and grilled beef tongue coated with thyme oil and laden with forest berries. Opt for the wine pairing, and you’ll enjoy these beauties with Spanish and Basque tipples, the likes of the 2014 Artadi Brut, Alava, and 2017 Lunares Rosado Rose, Ronda. Chef Kenjiro ‘Hatch’ Hashida takes over the kitchen of Neon Pigeon for a nine-course omakase and Sawahime sake pairing menu, scheduled for March 25 and 26. Hashida remains tight-lipped on what he’ll prepare so as “not to ruin the surprise”, but you can expect delectable bites which include roasted wagyu, sashimi plates and sticky yam with noodles. It’s not all about meat this week; Verde Kitchen has launched an Earth Hour and Earth menu available until May 31, which stays true to its mantra of “real food, full of natural flavours”. Dig into new favourites including the grilled tuna burger, where the sunflower brioche buns bookend the tuna patty bonito mayo, tomatoes and yuzu relish, as well as the oven-baked lemongrass lacto chicken decorated with spicy rice noodle and green herb salad.